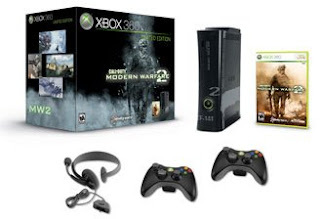 There was a lot of buzz in the air regarding today's announcement from Microsoft regarding a new 250GB Limited Edition, Modern Warfare 2 Style Xbox 360 console. This new bundle is set to hit the shelves the same day as the game itself (November 10th) and will include two wireless controllers. The Xbox 360 console will have a Modern Warfare 2 themed design and will include all the accessories that come with a normal Elite. Plus the nice 250GB hard drive, which is surely a hint about what is the future of the Xbox 360 platform(DVR, Media Center, Downloaded Games). The bundle will retail at $399 USD in the United States. One notable article to mention is that the 250GB hard drive will be limited to the MW2 bundle at this time, and will not be sold separately. This leaves the 120GB hard drive retailing at $149 USD, a steep price to swallow. Look for Microsoft to restructure hard drive prices in the near future. We are predicting that the 20GB will be completely phased out, the 120GB will notch down to $69 USD, and the 250GB should slide in at around the $99-$129 USD range. Not much else to report on this week... Did I mention that rumors are already surfacing within hours of this MW2 Limited Edition Console announcement that Sony has already prepped an equivalent 250GB PS3 Slim bundle that will likely drop during the Holiday season. My name is Matt. First, sory that I write you here, but I could not find the contact form. I really like your blog and I would love to make a link partnership with you. I also own a games related website www.321games.net . I am not like most of these sites, where they just put as many games as they can on it, I try to put only the best games online. Well site gets around 300 visitors each day. I belive we would both benefit alot out of this exchange and hope you will decide to do it. My e-mail is admin@321games.net . Feel free to contact me anytime and we will make an exchange. Best of luck to you with your blog in any case! p.s. I would also suggest you to add link to your site here: www.bldir.net . It will get you many new visitors!